I was a White House Policy Analyst to President Ronald Reagan and for over a decade the Senior Military Affairs Writer for the Naval Postgraduate School, the leading science and technology graduate research university of the Department of Defense. From years of one-on-one interviews with the highest ranking military officers and civilian Pentagon officials – all of whom I can identity to you by name – I can tell you with 100 percent certainty not only that the “Official Story” of who attacked this country and how they did it is a Hitleresque “Big Lie” but that there are dozens upon dozens of “Burning Facts” each of which standing alone proves that the Official Story is completely false and that 9/11 was an inside job made to happen. My focus in this memorandum for you is the Pentagon attack, which most others tend to ignore. The Official Story of the Pentagon is false in every respect, including these key elements: when the attack happened (the first violent event was almost eight minutes prior to the “official time”); the source of the damage (major destruction was due to pre-planted explosives); and the aerial vehicle that was destroyed (a plane smaller than a 757, provably not Flight 77, and on a flight path different from the Official Story). The first explosion went off inside the outer ring almost eight minutes before the Official Story says Flight 77 was anywhere near Washington. Key Pentagon witness April Gallop’s wristwatch was stopped by that explosion at 09:30 (the Official Story says the Pentagon was hit at 09:37:46). The digital clock embedded in the Doubletree Hotel security camera shows that the billowing black smoke began at 09:34:10 – well before the alleged impact more than three minutes later. Many Pentagon witnesses – some of whose names I can provide to you – reported sequences of explosions “like firecrackers going off” inside the building before the wall collapse, conclusive evidence of pre-placed explosives. Multiple witnesses including Chief of the Joint Chiefs of Staff General Hugh Shelton reported the “overwhelming” smell of the explosive cordite, and literally hundreds of Pentagon employees shouted out to one another that “bombs” had gone off. 2. The NTSB report on the Cockpit Voice Recorder (CVR) the government claims was from Flight 77, an American Airlines 757, allegedly ‘found’ in the Pentagon rubble states that it was a ‘magnetic tape model’ but the airline quickly put out a press release that it could not have been from any of its American Airlines 757s whose CVRs were “the modern solid-state version”; and as the Flight Data Recorder (FDR) ‘found’ near the CVR had to have been from the same plane, as the two ‘black boxes’ are located near one another in the rear, the FDR also could not have been from any American Airlines 757. 4. There was massive destruction, fire and deaths in the two innermost rings of the Pentagon, the fourth-in B Ring and the fifth-in A Ring – two rings further in than the furthest the Official Story claims any part of a plane penetrated: only to the third-in C Ring (alleged) ‘Exit’ hole. Others have focused on the anomalies at the WTC, including yourself. What has not yet been stated in these other Presidential memoranda is the fact that massive explosions went off in the basements of both WTC Towers before the plane impacts — 14 seconds before in the case of WTC 1 and 17 seconds before in the case of WTC 2. WTC 7, of course, was not hit by an aircraft at all and was an obvious controlled demolition. Fifty seven pages of “Burning Facts” — hard forensic evidence — proving that the Official Story is false — can be found in the Petition filed by the Lawyers’ Committee for 9/11 Inquiry demanding a Special Criminal Grand Jury to finally investigate the real cause of the collapses of WTCs 1, 2 and 7. 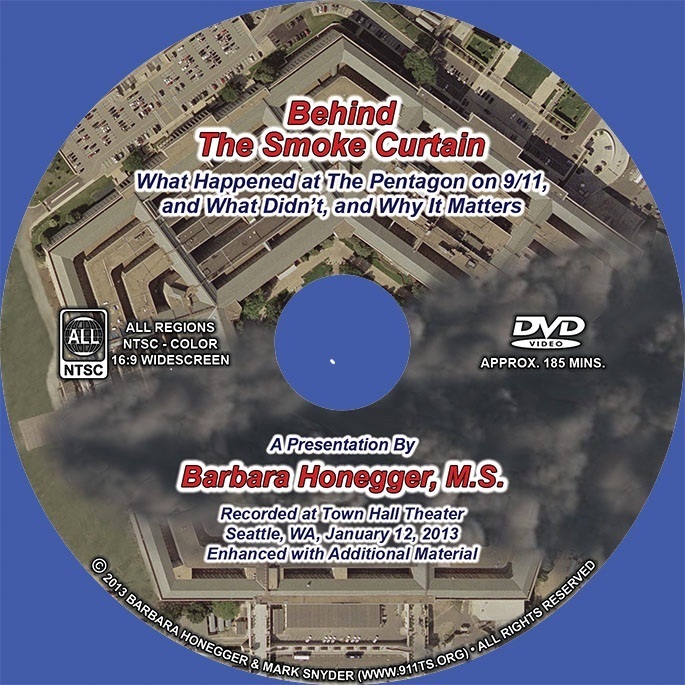 I produced the documentary “Behind the Smoke Curtain” that has been viewed by over half a million citizens. The facts in that video lead to the inescapable conclusion — explicitly stated in the final third which ‘names names’ — that 9/11 was an Act of War in service to a foreign power aided and abetted by a treasonous Fifth Column of dual U.S.-Israeli citizens and Israel-first loyalists placed in all of the key government and military positions to plan, execute and cover up the attacks by the then incumbent Vice President and Secretary of Defense — the true Axis of Evil of 9/11. The degree of complicity by the then incumbent President remains to be seen. I urge you to fulfill your campaign promise and personally lead an independent investigation into 9/11 that finally properly interrogates — under oath and with no wiggle room — all of the key known ‘persons of interest’ and that finally presents the American public with The Truth. Only With The Truth Can You Make America Great Again. Barbara Honegger, MS, has served tours in the Ronald Reagan White House and at the Department of Justice. From 1995 to 2011 she was Senior Military Affairs Writer at the Naval Postgraduate School, the top U.S. military science and technology graduate research university. She is the author of October Surprise on the Iran side of of the Iran/Contra scandal and has since 9/11 been among the leading researchers and public speakers documenting the falseness of the official narrative, producing, among other works, the YouTube documentaries Behind the Smoke Curtain and 9/11 Museum Virtual Walking Tour, and the white paper The Pentagon Attack Papers. Her work has been recognized by both U.S. and international Truth Movement organizations. She is a Board Member of the Lawyers’ Committee for 9/11 Inquiry and a founding member of Political Leaders for 9/11 Truth. She holds a BA from Stanford, an MS from JFK University, and masters level certification in national security decision-making from the Naval War College. Ms. Honegger has run twice for Congress in California. Barabara Honegger, “Pre-Planted Pentagon Explosives Went Off Almost Eight Minutes before Any Alleged Impact on the Building,” American Herald Tribune, 14 July 2018.